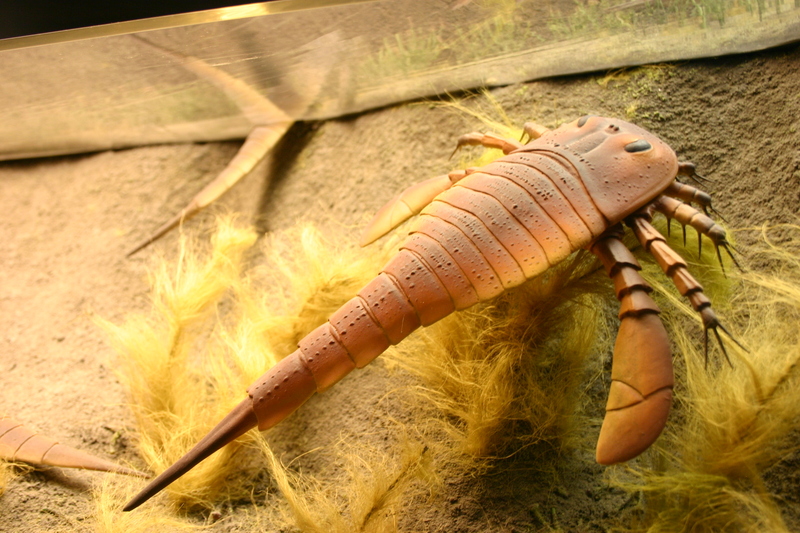 Eurypterids, known as the sea scorpions got the name from the greek word "eury" meaning broad or wide, and "pteron" meaning wing. Although they are called sea scorpions, only the earliest ones were marine, later ones lived in freshwater, and they were not true scorpions. According to theory, the move from the sea to fresh water had probably occurred by the Pennsylvanian subperiod. Some studies suggest that a dual respiratory system was present, which would allow short periods of time in terrestrial environments. Eurypterids are believed to have undergone ecdysis, making their significance in ecosystems difficult to assess, because it can be difficult to tell a fossil moult from a true fossil carcass. They became extinct during the Permian–Triassic extinction event. Eurypterids have been regarded as relatives of the horseshoe crabs, together forming a group called Merostomata. Subsequent studies placed eurypterids closer to the arachnids in a group called Metastomata. They have also been regarded as relatives to scorpions, since they look like them.